Over only a few seasons, Clapton FC has seen a huge rise in the number of supporters from around twenty in 2013 to a staggering 761 in October 2015 for Non-League Day. Already since the start of the current season, attendance is consistently between 200 to 300 fans at home games, generating significant income for the club. However, exactly how much money and how it is spent is far less clear-cut – it is almost impossible for Clapton fans to have any say or influence in the running of the club, which is tightly controlled by its purported 'owner', Vince McBean. Imagine the difference if Clapton FC was owned and managed by its supporters? If income was completely transparent and ploughed back into improvements of facilities and the pitch? If we looked after our players and properly encouraged them to stay? If the skills and commitment of the club's fans was welcomed and encouraged, rather than treated with suspicion? In 2013, the three life members of the original Clapton FC re-established what we consider the 'real' club, which has an executive committee and a membership of over 150. The ongoing dispute over the ownership and control of both the club and the Old Spotted Dog Ground, as well as the shambolic way that both are currently managed, is fairly complex – you can read the background here . What is absolutely clear, however, is that nothing will change and there is no prospect of Clapton FC flourishing under the control of its supporters until this dispute is finally settled. Efforts have been made to try to achieve this without the need for legal action, but it is increasingly apparent that the only way to resolve ownership of the club and the ground is through the courts. 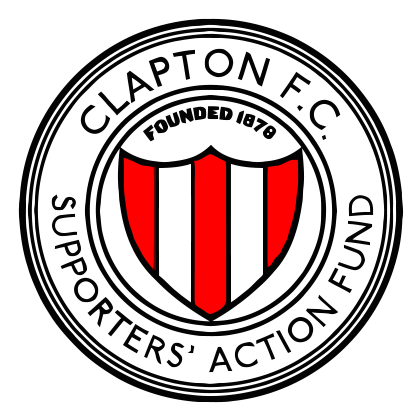 We are therefore launching a Clapton Supporters Action Fund, with all money donated going towards transforming Clapton FC, with the help of Supporters Direct, into a club that is fan-owned and fan-managed. In the short term this will include funding for legal action to rescue it and secure its immediate future, but your donations will also help us plan for a genuinely revitalised club. 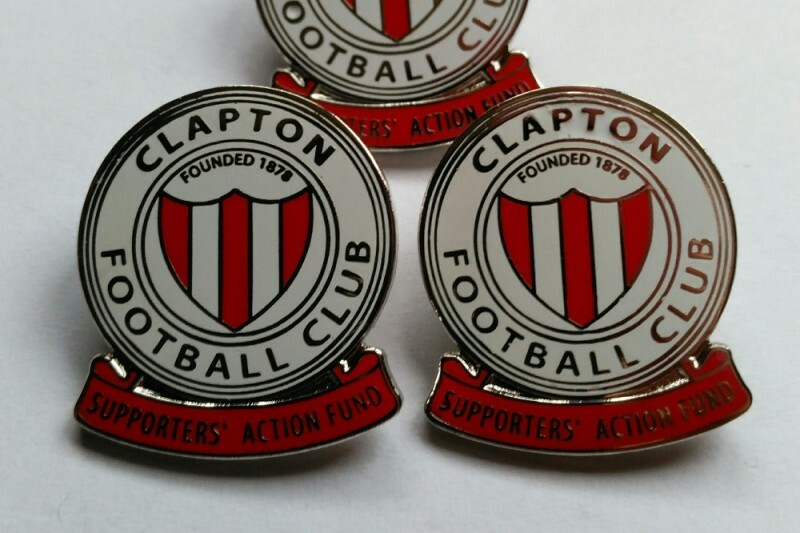 If you want to help build on our club's long and proud history, please donate to the Clapton Supporters Action Fund. Everyone donating at least £20 will receive one of our limited-edition "Supporters' Acton Fund" badges. Thank you for your continued support. Here is an update on how things currently stand. Thank you to those who have already done this - we are just finalising the design for this year's cards and will aim to get them printed and sent out very soon. As you may have heard, supporters have responded positively to our call not to attend home games at the Old Spotted Dog, but to maximise attendance at away games. This has been tough in recent weeks with so many games at home, but the numbers entering the ground has dramatically decreased. The reason for this action is straightforward: we believe McBean is in trouble. He has been hit with a requirement to provide evidence to health and safety inspectors and faces enforcement notices for significant ground improvements. Without thousands of pounds of supporters' gate money, he must bear these financial burdens himself. Separate from issues about the ground, we are talking to solicitors about how much more we may need to raise to begin further legal action to take over control of the club itself. We aim to report back to supporters on this within the next few weeks. Despite the efforts of Clapton FC members and the Clapton Ultras, as well as the generous donations from all our supporters - we fell short of meeting our £10,000 target by June. The current situation is now critical – the liquidation of the charity operating the Old Spotted Dog ground back in April has been stayed by a High Court injunction, but a new season has started. A structurally unaccountable club controlled by the current regime continues to play in a ground whose future and status is uncertain, with no permission to do so from the appointed liquidator and no transparency over where any gate and bar takings are going to. Clapton FC - the real club owned by its members and reconstituted in 2013 - has recently voted in an Emergency General Meeting to boycott all home games, and this call has been answered positively by the Clapton Ultras. Further legal action is crucial to secure the immediate future of Clapton FC, and will be launched as soon as we have secured the funding to do so. Your support is urgently needed and we hope you can dig deep to help save an important part of London’s footballing history. Yesterday, the attempted liquidation of the charity that holds the lease to Clapton's Old Spotted Dog Ground was put on hold by a judge at a hearing at the Royal Courts of Justice in central London. This prevents the liquidator appointed by the current regime from giving away any assets without the court's permission. The case returns for a further hearing in a few weeks time. On the next two Saturdays, we are distributing hundreds of leaflets urging supporters to join the real Clapton FC, to help raise more funds for the cause and to participate in discussions about what the club will look like when we win and take over. It is an exciting time - we encourage everyone to get involved in whatever way they can. Thanks to everyone who has donated recently - the response has been amazing. I wanted to give a quick update on where things currently stand. As many of you will know, there are currently two battles that the current regime faces - one over control of the Old Spotted Dog Ground and another over control of the club. The remaining 77 years of the lease on the ground is held by a charity called the Newham Community Leisure Trust (NCLT), which is supposed to remain separate from the club and is responsible for upkeep and maintenance. Its income comes from leasing the use of the ground to Clapton and London Bari and from other sources for use of the clubhouse, pitch and warehouse. However, the charity faces serious allegations of mismanagement and is currently under investigation by the Charity Commission, which has taken over control of NCLT's bank account. The current regime’s self-styled ‘Chief Executive’ is also an NCLT trustee, but is facing suspension and the possibility of disqualification. His response has been to try to push NCLT into liquidation over 'loans' he claims he is owed – the day before he was due to be interviewed by the Charity Commission. If NCLT is forced to appoint new trustees, they can demand payment of any unpaid rent and an end to activities that breach the terms of the lease. Liquidation could also hand control to another charity. In both cases, Clapton FC could find it is unable to return at the Old Spotted Dog next season if it is still under the control of the old regime. In the worst case, the current ‘Chief Executive’ manages to transfer the lease to a new company he has set up called Veercourt – one that, unlike a charity, is allowed to pay its directors. Meanwhile, all the gate money from the best-supported team in the ESL continue to go to the club itself, supposedly an ‘unincorporated association’ that supporters should be able to join but that has been closed to new members (for 'restructuring') since 2013. The real Clapton FC, re-established by fans the same year in opposition to the existing regime, is raising funds to launch legal action against this refusal to allow anyone to join, participate or make decisions. We expect to have launched our action by June 2017.